If you need assistance with a domestic animal, such as a dog or a cat, you need to call your local Maricopa county animal services for assistance. They can help you out with issues such as stray dogs, stray cats, vaccinations, licenses, pet adoption, lost pets, and more. No county in Arizona will assist with wildlife control situations, and there is no free Phoenix animal control services for wildlife. FOR WILDLIFE ISSUES: Phoenix Wildlife ™ is a professionally operated nuisance wildlife control company servicing the greater Phoenix Arizona area. 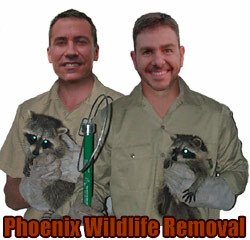 We specialize in the removal of unwanted wildlife from property, homes, and buildings. We remove any kind of problem animal - from a snake in the yard, to a colony of bats in a building, to squirrels in the attic, we are the experts at humane wild critter and rodent control in Phoenix AZ. We are fully licensed and insured, and we operate twenty four hours a day, seven days a week. Give us a call any time, and we will discuss your wildlife problem, and come out immediately to solve it. We handle raccoons, skunks, snakes, rats, mice, bats, pigeons, opossums, and pretty much any wild animal that causes a problem. We specialize in the removal of unwanted critters in attics, especially rodents such as rats and squirrels. Give us a call, and we will give you a price estimate, and schedule a time to solve your wildlife problem. ADVICE: What should you do if you find a litter of kittens? This thing might have happened to almost everybody. You might have gone out for a walk along with your dog or went to a nearby park to enjoy the weather, wherein you could have heard soft “mew, mew” sounds. Before you actually realize what has happened, you will end up being the caretaker of a litter of kittens. Mostly kittens that you discover in such outdoor places are the progeny of feral or stray cats that are not socialized towards human beings. The 3rd, 4th and 5th months of the year are the expectant pregnancies of cats. In other words, this is also the time of the year when you are liable to bump into young litters. Whenever you encounter kittens on the outdoors, you might be enticed to take them to your home; however that actually may not be the best thing that you can do the kittens. Yet, deciding on what to perform, when you discover kittens actually depends on various things. The initial step to take is to ascertain the kittens’ age. How to determine it? The kittens that have their eyes shut, ears folded downwards, and not walking are said to be less than 7 days old. They will purr and make tiny sounds. Kittens that have their eyes open to some extent and also are blue, and ears starting to open can be counted as 1 or 2 weeks old. They will crawl, snuggle and knead mostly. Kittens that have their eyes wide open, ears wide open and stand up straight can be brought under the category of 3 weeks old ones. They will react to movements and noises and will start to take their initial steps. Around 4-6 weeks, the kittens will start to run, play, pounce and dig. They stare to wean and will possess eyes that have transformed completely from blue to their mature color. Close by 8 weeks, they will start to appear like fully grown cat versions. This is considered to be the paramount age to start the socialization procedure. Just since you found the kittens alone, it does not mean that they are left alone by their mother. The mother cat might have gone out in search for food and so you need to wait for one or two hour’s time and watch from a distance. Finally, you need to employ your verdict, depending on the needs of the kittens and also your resources and time to look after them. However you need to note down the fact that if they are not weaned, and you opt to take them with you, they will need constant and incessant care and regular bottle feeding. But what if the mother comes back? You need to check whether the mother cat is friendly enough and if she is so, then you can opt to take both mother cat and the kittens, until kittens become old to some extent wherein they can be weaned and then adopted. You must then neuter or spay the mother cat and then return it back to its place or leave it in an animal care organization. Wildlife Professional Douglas of Maricopa County remarked hard feelings about the concern have split his community and even his church. “I’ve been intimidated, threatened and vandalized because I’ve had the lack of sense to speak out against dog critter stalking," Wildlife Professional Douglas remarked. Dog exterminators counter that many opponents who are stalk exterminators are exaggerating. They simply don’t like that other people use what is possibly a different method to catch. “Don’t change it because of complaints from people who don’t like the way we animal capture," remarked Wildlife Professional Douglas of Maricopa County. “There’s room in the woods for both of us." We attempted to get more information from Maricopa County animal control experts, but could not. Dog critter stalking opponents say it boils down to private property rights. “I feel like what is possibly a man should have what is possibly a right to his property without threats and abuse," remarked Jack Martin of Maricopa County. “A man should have the right to use his property as the humane society manager sees fit." “The rights of the dog exterminators end where the rights of the private landowners begin," Extermination Professional Gerard remarked. Board member Wildlife Professional Douglas asked Extermination Professional Gerard if the humane society manager had knowingly leased land in an area where dog critter stalking was taking place. Extermination Professional Gerard remarked the humane society manager had. The humane society manager remarked the humane society manager was told dog exterminators respected property lines and took them at their word. In other business, Commissioner Critter Man Maurice remarked the humane society manager would appoint what is possibly a committee to make recommendations on what is possibly a three-bucks-per-year limit. The committee would make what is possibly a recommendation on the suggestion and on the feasibility of what is possibly a tagging system. We will appoint what is possibly a man from the Arizona Creature collectors Federation to the committee and will ask wildlife biologists to participate. The humane society manager did not know who the other members would be. On board member Wayne May’s urging, the advisory board recommended moving the opening of dove season in the Northern Zone to Sept. 22. All West Arizona counties are included in the Northern Zone. Board member Grant Lunch opposed the change and several other members questioned the change. Wildlife Professional Douglas noted that surrounding states all open Labor Day seven day period end. This report is not verified by Maricopa County pest control companies.